It’s been raining in northern California, a lot, these last few weeks. It feels good. It’s a wintry assertion of normal, natural cycles. During these last few weeks of prioritizing rest and recuperation, I’ve been discovering how deeply fatigued I am. Below the surface, down under the cover of activity, there is an exhaustion that I habitually and persistently deny. I’ve pushed through it for years, risen above it on a daily basis. Last week when I allowed myself to let down and focus on a respite, I peered right into that hole of depletion. And immediately reverted to typical behavior. Instead of accepting a need for rest, I bounced off fatigue and flew into action. I replenished energy the cheap and easy way with sugar and caffeine so I could do more, be more. When I ran out of steam again, I consumed distraction and entertainment. I resisted normal, natural cycles. I boomeranged back into busyness. It’s such a seductive temptation to soldier on. Because in one way, it works. I got the Christmas stuff sorted out and stored away. I caught up on my end of the year financial business, files all readied for the new year. I cleaned out and tidied two closets. It felt rewardingly productive. A part of me relished it. And so it seemed worth it while I was at it. Sometimes it is. Sometimes there isn’t a choice. But a lot of times, I do have a choice. All of the things I did needed doing. Sort of. Yet, ultimately, my cyclone of activity left me even more tired, and discouraged. I had set myself to catch up on rest, not household chores. Which lead me to wonder: Why is it hard to rest? To take time out without feeling like my time could/should be better spent? Why this pervasive bias that ranks outward productivity above self-care and natural cycles? I think there’s a number of reasons for this. There’s a desire to prove myself in a culture that is action- and results-biased. Endless to-do lists and innumerable activity options also contribute. As does the desire to help, be of service, be needed. Perhaps even more, I have feared what lurks in the still places. The act of slowing down and being quiet with myself opens space for challenging questions to come forward. What does my life add up to? What do I add up to? How do I live life so as to create a permeating satisfaction? Here is where the awareness that death alone is certain abides. It is a vulnerable and scary place. It can seem impossible to grab an anchor or steer a course in this unpredictable territory. Some part of me, I’m going to call it my soul, yearns to venture in and probe into these questions in hopes of creating a peaceful relationship with reality. But honestly, it’s a lot easier to stay way too busy to go anywhere near that vicinity. Except the yearning persists. And, when I’m rested, I’m grateful that it does. Quiet time is where I meet myself and can befriend myself. Reflective or creative endeavors are where I’m likely to unravel puzzles and peer into bigger frames of reference. Striking off the predictable path, I stumble upon understandings that I’d never arrive at through rational, logical thought processes. Sometimes, when I sink into this place, instead of maintaining a protective barricade around my heart or shielding myself from the view, I can surrender to what is. In this moment, I can stop needing the world to be different. There is peace in that. Showing up in this space and wading into the questions, I discover who I am. The offering is increased clarity. Delving into stillness is the place, and accepting the reality of death as the only certainty is the motivation, to clarify values. So that, to the best of my ability in the precious time I have, I fashion a life that runs the course with them. It’s tempting to think of this as too much to tackle. Sometimes it is. But when I’m rested, I see a priceless opportunity to unfurl my unique self. It is precisely because the answers to these questions are not black and white, neither universal nor rigid, that living my own life to my satisfaction requires I show up for this. Lack of familiarity and support makes this adventure tricky, but the more I visit this place the more comfortable I find myself. The more landmarks and beacons become visible. 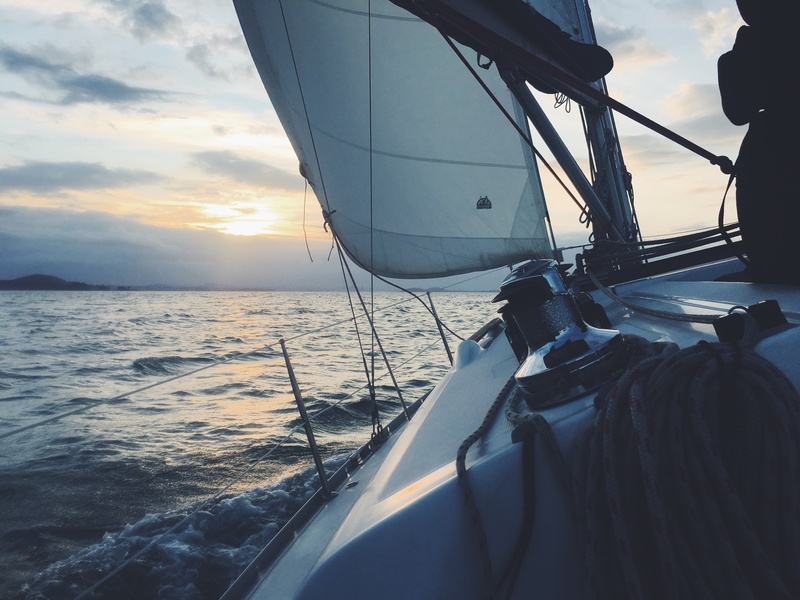 With my hands on the tiller, the values I clarify provide me ballast and keel, both stability and direction, in times of easy sailing and big seas. This entry was posted in Leaning In, Values, Vulnerability and tagged Ester Buchholz. Bookmark the permalink.